The loom is buried under lots of other things, as the quick remodel we had envisioned has stretched on much longer than we anticipated. Everything has to move from one room to another while work is being done, then moved yet somewhere else for the next job! Good luck with your Rasmussen loom! 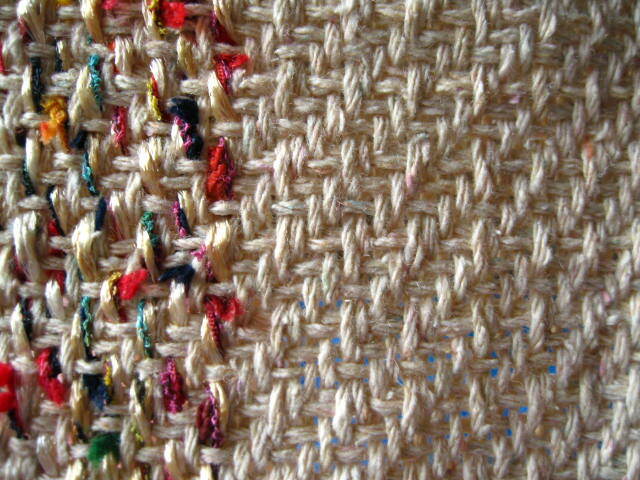 This is part of some cloth I hope to sew into a carrying case for my spinning wheel. 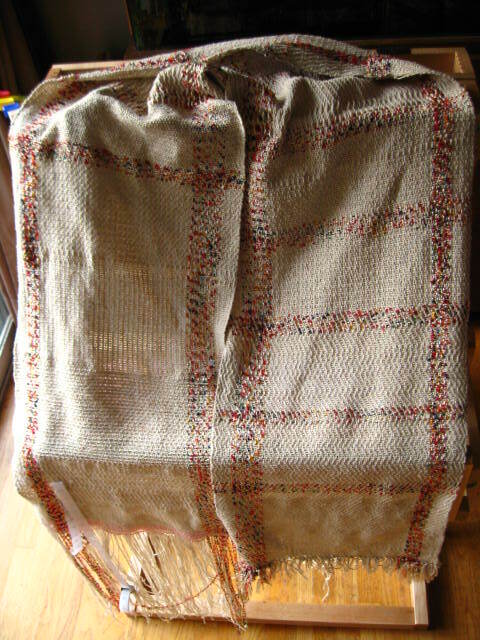 It’s a bit looser in weave than I’d like (I want a close, hard-wearing cloth), but I’m already all but whacking it with the reed when beating. I was wrong in thinking we had reached loom saturation. With looms crowding all available indoor space, I thought we were safe from any newcomers. That was not to be the case, as this perfect, two-year old (a mere babe! 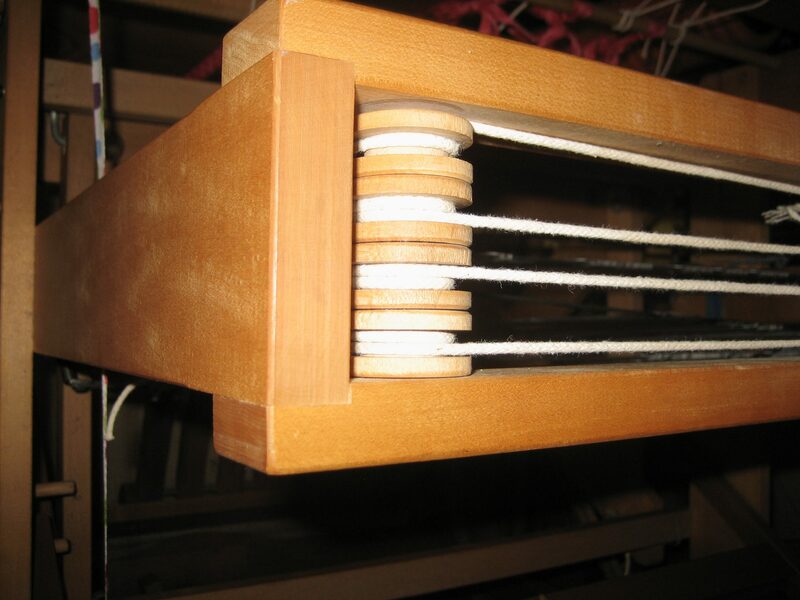 ), 24″ Leclerc Dorothy table loom with eight harnesses and stand insisted on following me home. 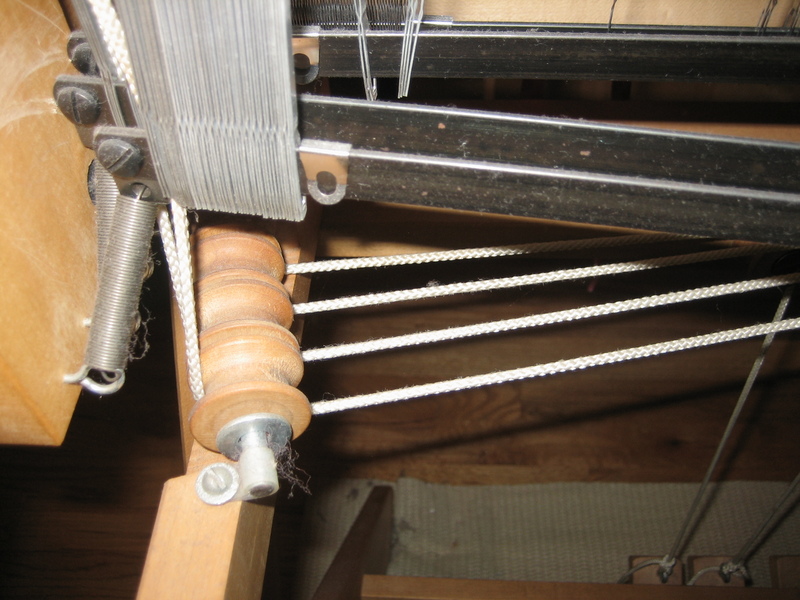 This loom came along with four stainless-steel reeds (which will be used interchangeably with my 25″ Rasmussen loom) and 1,600 metal heddles. 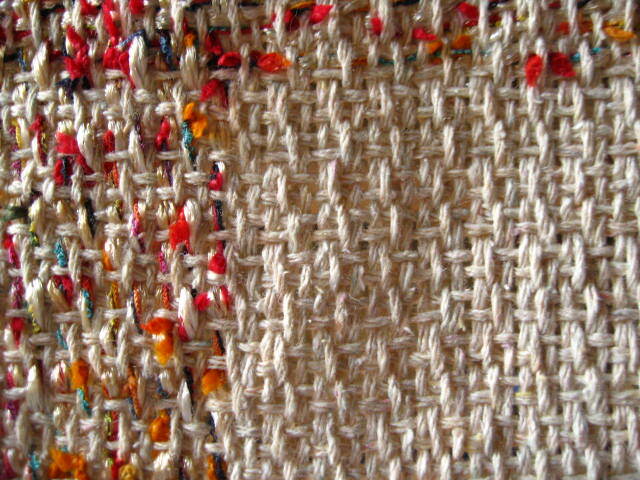 800 of the heddles are inserted-eye heddles and brand-new, never used or even installed. The first thing I did was to e-mail Leclerc to ask about the safety issues of using inserted-eye heddles. 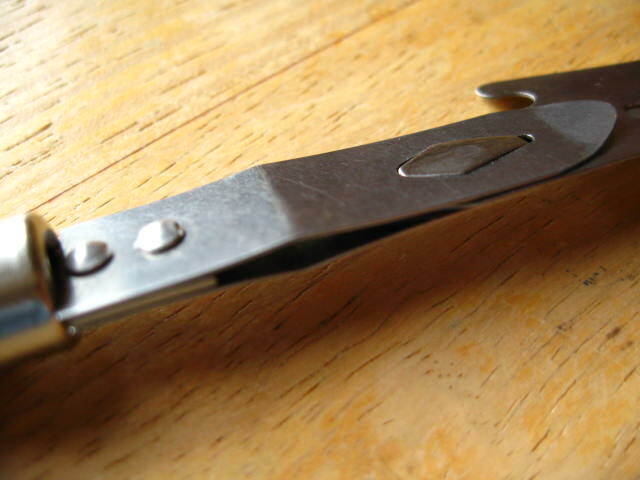 Robert Leclerc’s book, “Warp And Weave”, mentions that they are made using lead solder around the eyes. 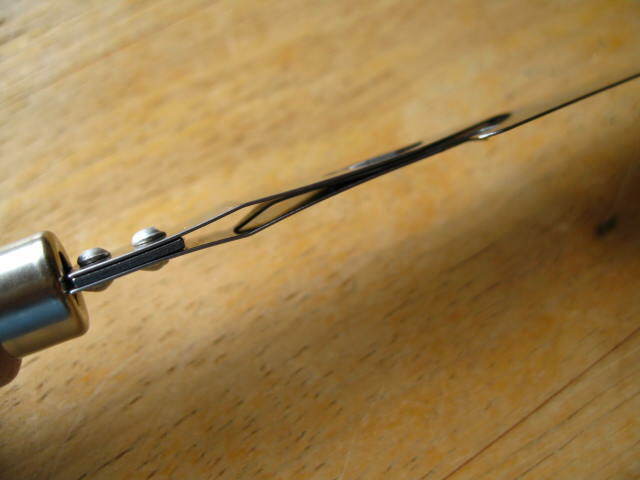 Their response was very quick; the heddles are nickel-plated (although I don’t know if that means they are plated over lead solder, or if the solder is no longer used at all), and should pose no issues. 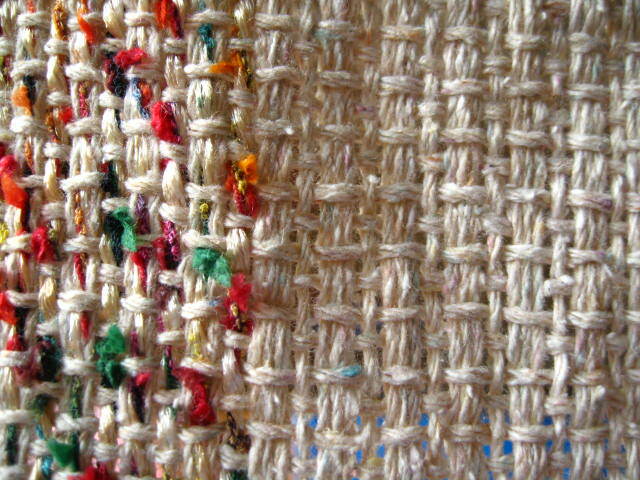 Then I spent an entire day removing the original heddles and installing the inserted-eyes. (Moving heddles is not my idea of fun…) After trying different ways to speed this up, I found that the ol’ “one-at-a-time” was still the fastest, since they needed to be sorted for direction. 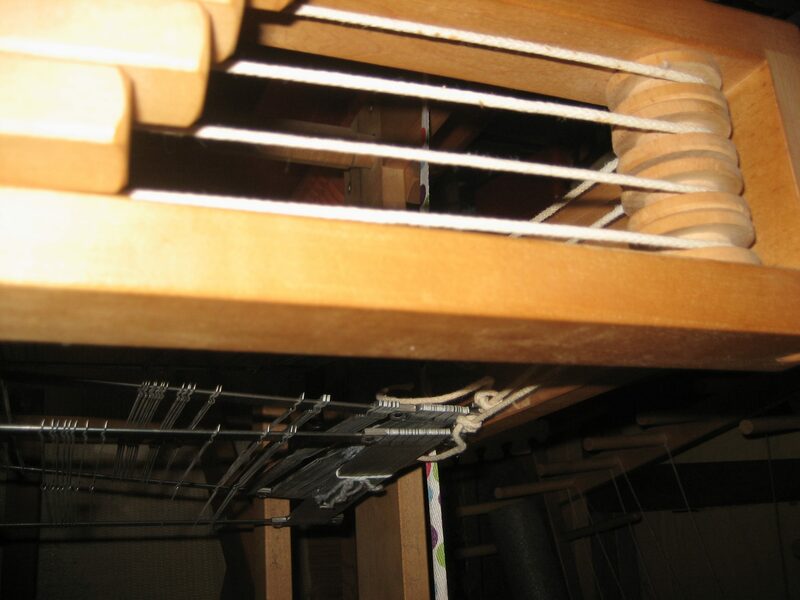 The harnesses on my portable (and yet unused) loom (“Hi And Goodbye” or “Bergman Treasures And A Reprieve“) are wooden, but if I can change them to metal, I hope I can retro-fit the heddles removed from the Leclerc loom to replace the hap-hazard string ones. I feel this loom has a name, but I’m at a loss to divine it. The name is blocked from me because Leclerc already named it “Dorothy”, so I keep thinking that, or “Dot”, neither a name I feel fits properly, especially since I’m not even sure this loom is a “she”. Perhaps this loom also feels conflicted. It’s a tad noisy; with metal harnesses to push up and drop, there are some swishing and thumping sounds. But the sounds are muted and not clanging or crashing, and not in the realm of requiring ear protection. (I added some foam packing in several places to mute the sounds further.) 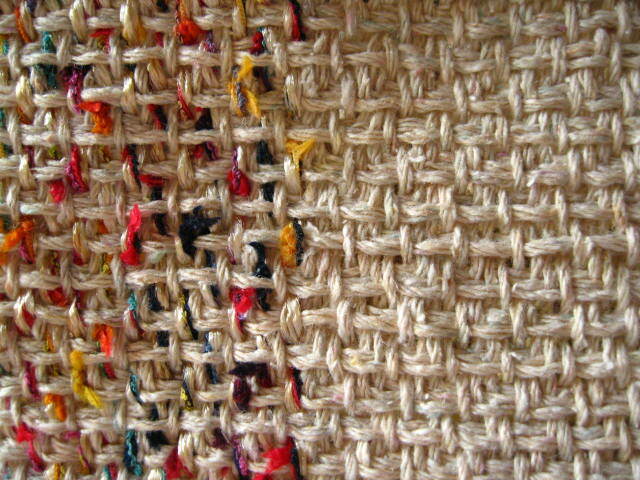 I can still listen to music while weaving. 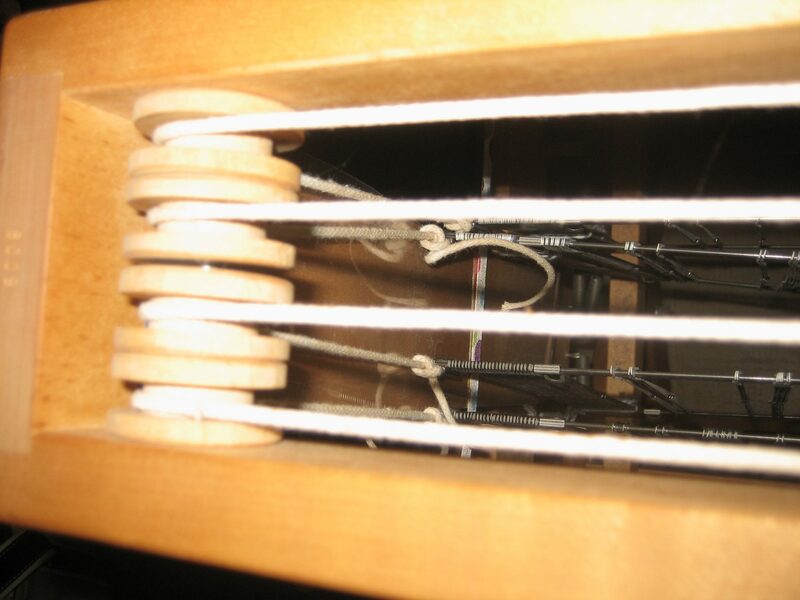 It takes a little muscle to depress the levers (due to the weight of 800 metal heddles), especially the four on the left-hand side for the fifth through eighth harnesses (those are slightly farther away to reach). Unfortunately, the table legs sold by Leclerc only come with four treddles for the front harness assembly, so they wouldn’t help with the second set of harnesses. 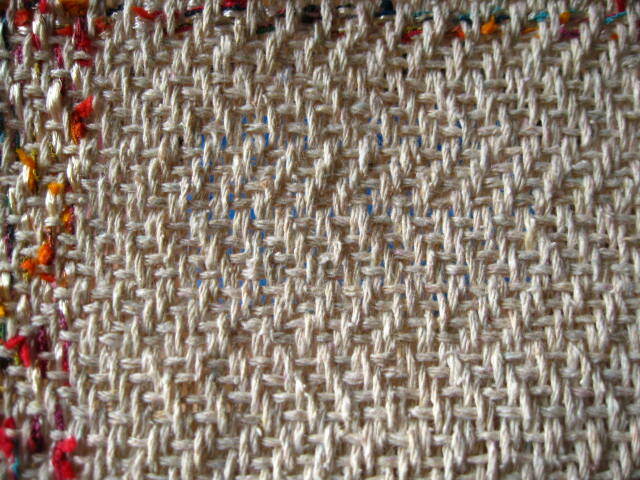 I found that rubber-banding the harness to keep the unused heddles closer to the levers, and sitting up higher and using more wrist and arm (rather than finger) motion helped with the leverage and reach; perhaps my arms will get toned whilst weaving! 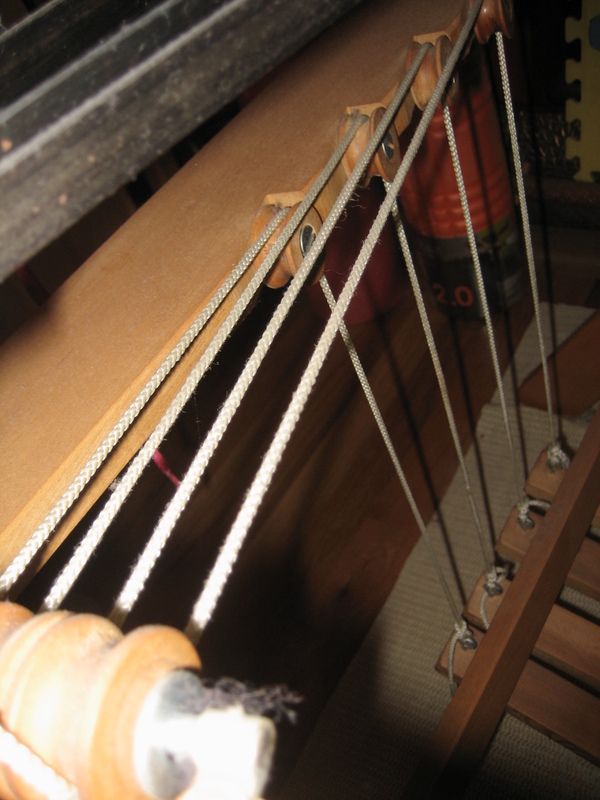 Looms with treddles are preferable, but these levers do slide smoothly and easily. 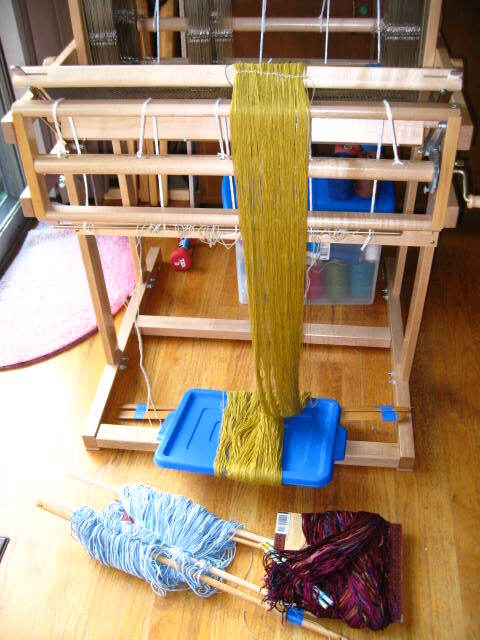 I was only just able to attach the loom to the stand by myself (being too impatient to wait for help). It’s really best as a two-person job. 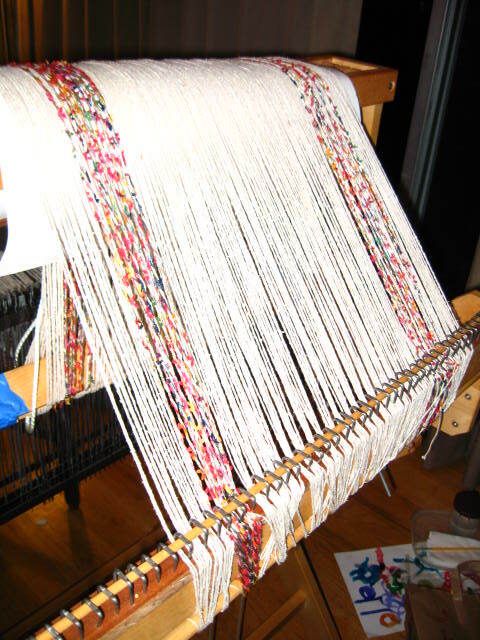 The loom installs onto the stand with screws, so it is not a quick thing to detach, and the stand itself does not disassemble quickly. It’s very easy to remove the harnesses and to install heddles. 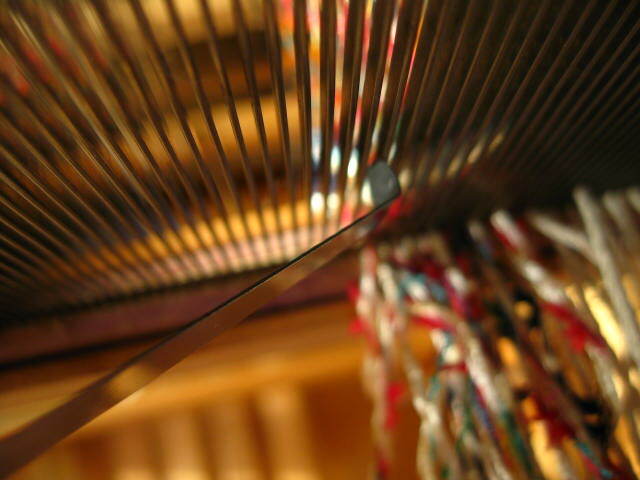 The metal bars that hold the heddles are made to flex and pop out of the grooved tracks that they slide in. No tie-ups or cording to fuss with. 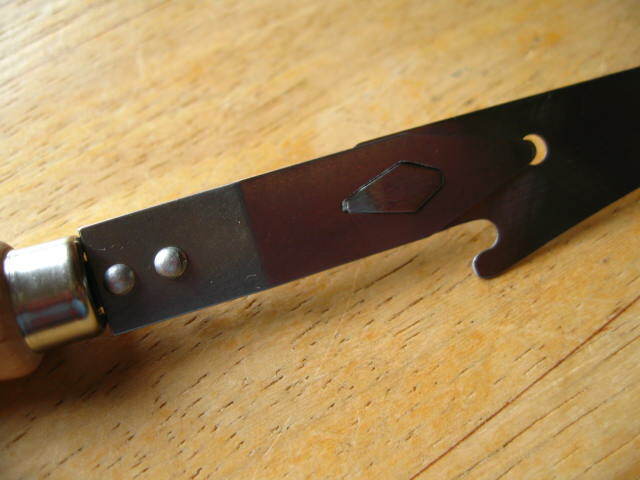 It has a friction brake, ah, the friction brake! 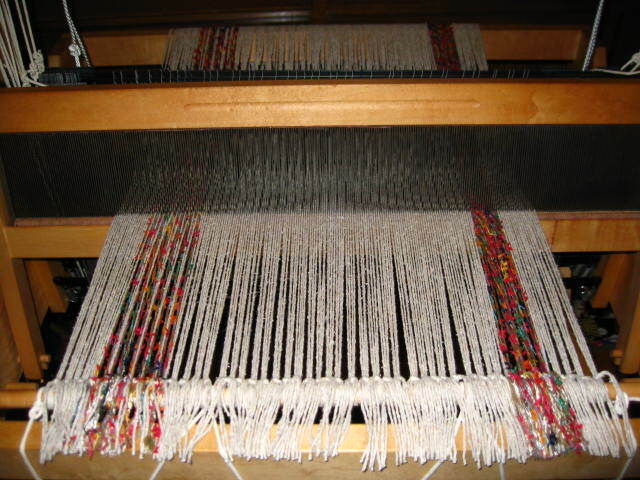 With my 25″ Rasmussen, I constantly had to get up to go to the back of the loom (on the less accessible, for me, left side of the loom) to release the back beam. 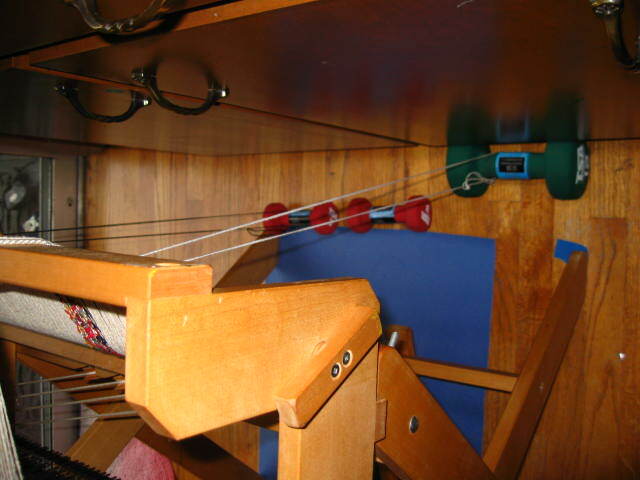 With this loom, the brake mechanism and cloth beam ratchet are operated on the front, right-hand side. 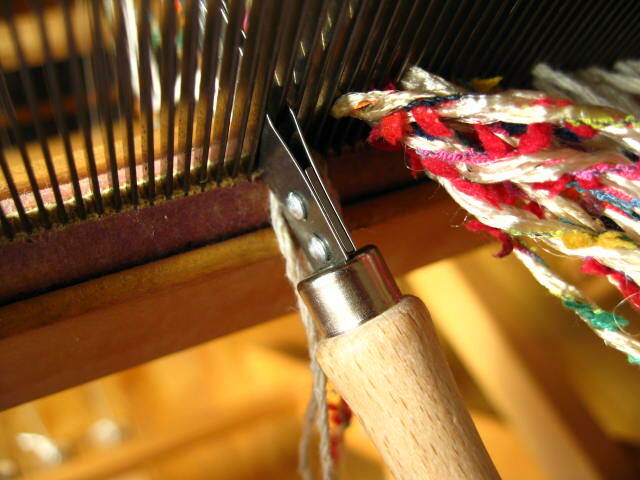 So, advancing the cloth every other inch (to keep the reed hitting the fell line at a ninety-degree angle) is very easy and fast. 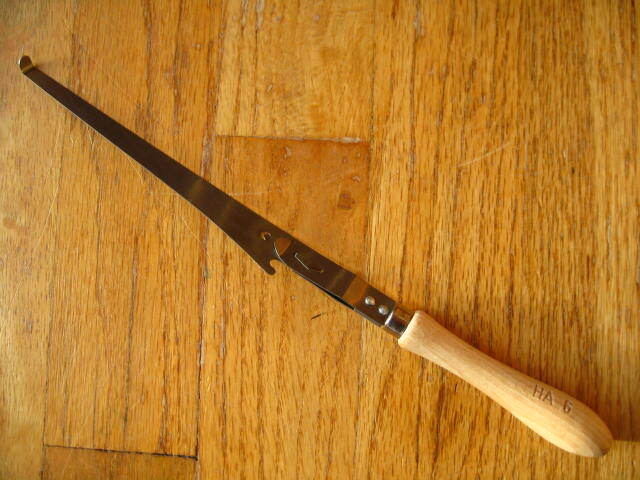 And, even if I need to fiddle with releasing the back beam, it’s on the same (right-hand) side as the front release. 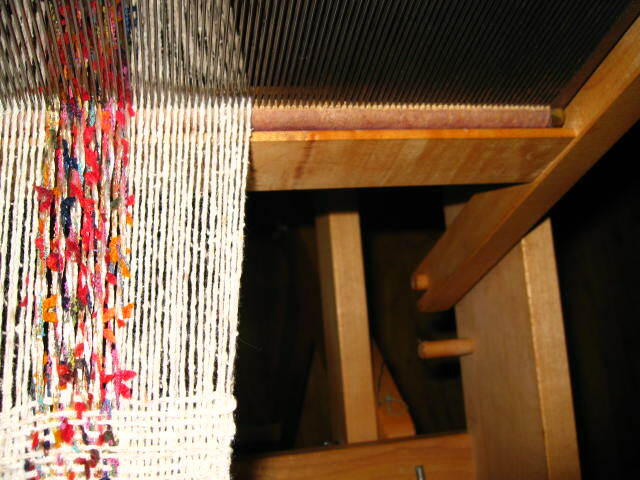 While the stand does not collapse quickly, it is very sturdily made, allows for customising the height of the loom. The two side tables are very handy assets, and they do attach and detach very easily. 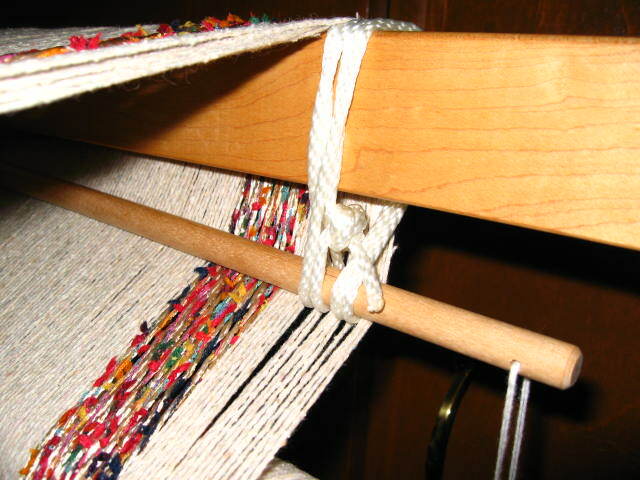 Thoughtfully, Leclerc added very thick rubber grips to the bottom of the stand, so weaving does not rock or move the loom. 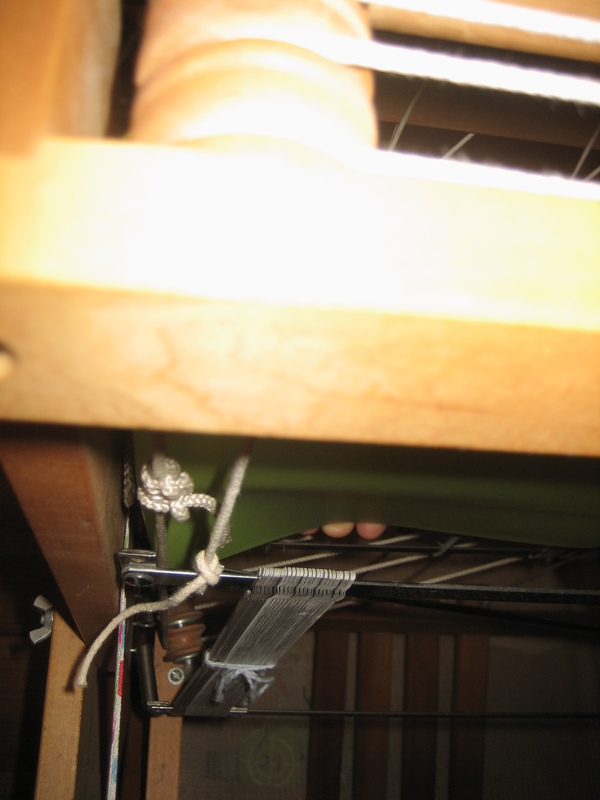 If I remove the second harness box (harnesses five through eight), the loom folds for portability. 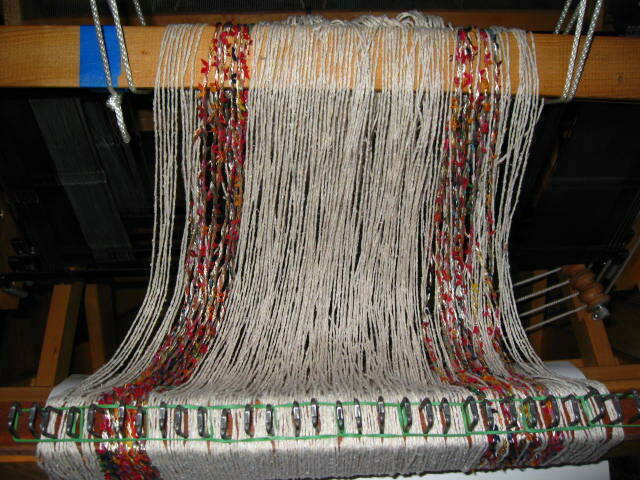 Realistically, unless I take a long weaving workshop, I do not see myself doing that, as it’s a very solidly constructed loom, and heavier than the 25″ Rasmussen. 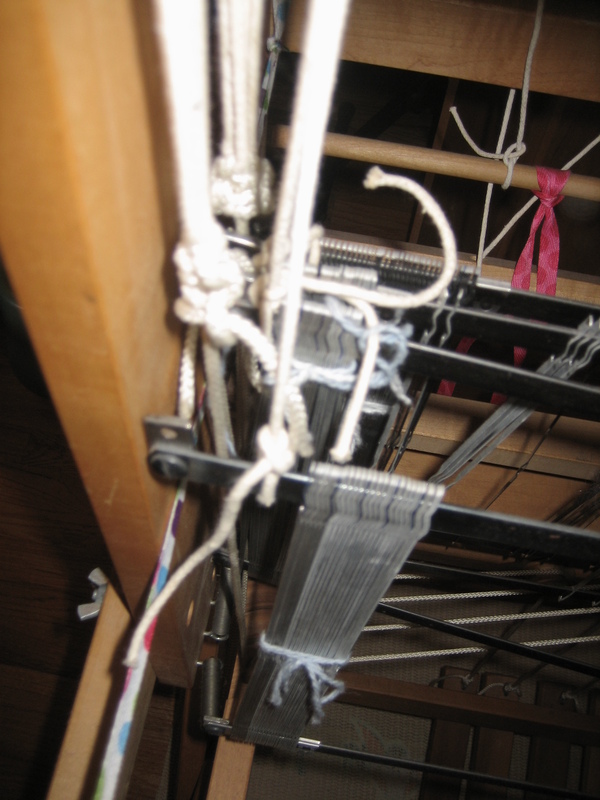 (Then there is the matter of taking apart and re-assembling the loom stand.) If I’m to be limited to four harnesses, I’ll stick to my 22″ portable. A very huge plus for us is that in its current location, we can open the drawers to access our silverware without moving the loom (as we had to for the Rasmussen, which has been ousted to the laundry room)! Changing the shed is as simple as depressing the levers for the next set of harnesses; the extra step of releasing the current harnesses is not required. As I use this loom, I am finding that Leclerc added many thoughtful extras to it, including rubber pads to keep the reed assembly quiet as it is returned toward the castle, metal apron rods, a shuttle race, ergonomic dimples to help depress the harness levers, and rounded edges on some parts of the wood frame so they do not chafe against the body. It’s been a pleasure to discover these subtle and intelligent polishes; weaving on this loom is like experiencing the upgrade to a grand piano from an upright (Rasmussen).